Outside the Great Hall at Cooper Union’s Foundation Building. 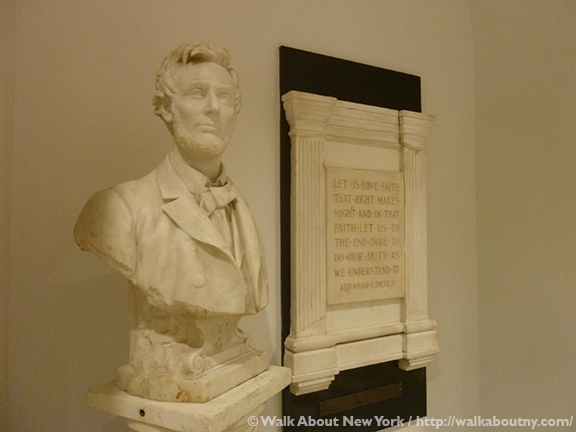 Abraham Lincoln’s strongest association in New York City is with Cooper Union’s Great Hall. 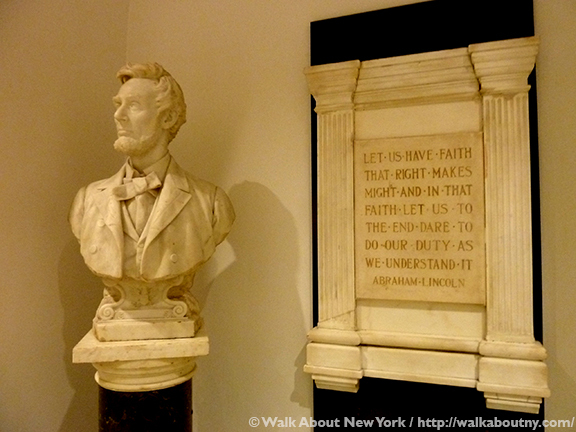 The speech he gave there is widely seen as the start of Lincoln’s run for the presidency. Honest Abe himself credited the speech, which has come to be called his “Right Makes Might” speech, with playing a major role in his rise to the White House. It was delivered on Monday, the 27th of February 1860. Because Peter Cooper (1791–1883) was a Jacksonian Democrat, and had served on the New York Board of Aldermen as such, his invitation for Lincoln to speak may have seemed at odds with his political views. However, Mr. Cooper and Lincoln shared an ardent hatred of slavery; and he was eager to provide an opportunity for the young lawyer from Illinois to make the case against slavery. Abraham Lincoln (1809–1865) visited New York briefly six times in his life; his body lay in state at City Hall before traveling to other part of the country and finally to its resting place in Springfield, IL in April 1865. The tallest structure in New York that Lincoln would have seen would have been Trinity Church. Public transport was limited; walking was the primary means to get about. The tallest office or residential buildings rose to only five or six stories; most buildings were wood-frame structures. At seven stories the Cooper Union’s Foundation Building was considered a skyscraper! Demographically the city was going through tremendous growth as a result of immigration; but New York City had not yet experienced the huge numbers of immigrants that would arrive from southern and eastern Europe, Asia, and Latin America following the Civil War. Lincoln and Mr. Cooper became stronger allies during the Civil War. Lincoln’s plan to welcome former slaves into the Union army faced strong opposition from Northern states in 1863. This move was seen as a major step toward emancipation. Mr. Cooper sent the commander-in-chief a public letter backing his action. After the Emancipation Proclamation was issued, Mr. Cooper invited Fredrick Douglass (?–1895) to the Great Hall to defend the policy. Built in 1859 the Cooper Union’s Foundation Building, at Seven East Seventh Street, was as a college founded by industrialist turned philanthropist Peter Cooper. 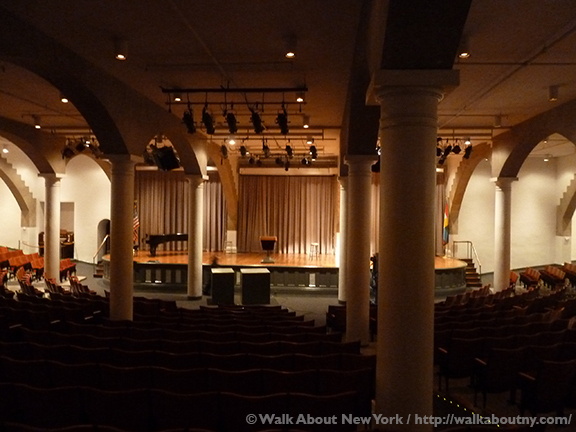 In the basement is an auditorium known as the Great Hall; it has been used since the building was constructed. The Great Hall has hosted many famous speakers. Before being elected to the presidency Abraham Lincoln, Ulysses S. Grant, Grover Cleveland, William Taft, Theodore Roosevelt and Barack Obama spoke there. Barack Obama also spoke in the Great Hall as president; Woodrow Wilson and William Jefferson Clinton did too. The Great Hall at Cooper Union’s Foundation Building. Officially the Great Hall is closed to the public except when events are held there. However, sometimes it is possible to wander in during the day; your success depends on what mood the guard is in. Enter by way of the doors facing Cooper Square; walk down the ramp to the right to the Great Hall. 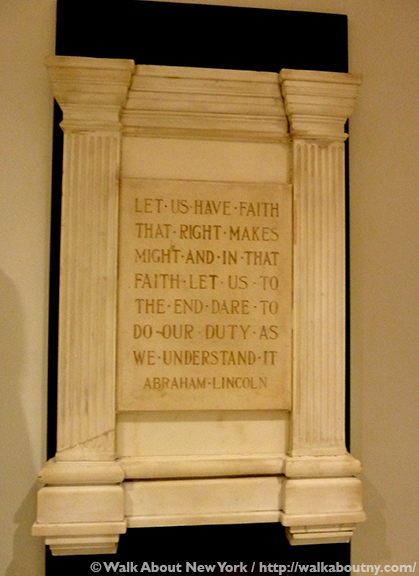 The Hall still uses the cast iron lectern that Lincoln and others have stood at. On a side wall of the Hall are portraits of people associated with Cooper Union, including a portrait of Lincoln as he looked in 1860. There’s also a small but excellent exhibit on the history of the Great Hall, with several busts, statues, artifacts, photographs and more. 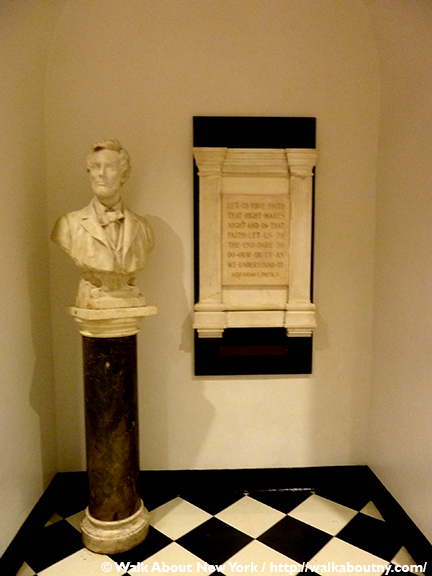 The bust of Lincoln and the plaque pictured in this article are included in this small exhibition; but no information about it was available. 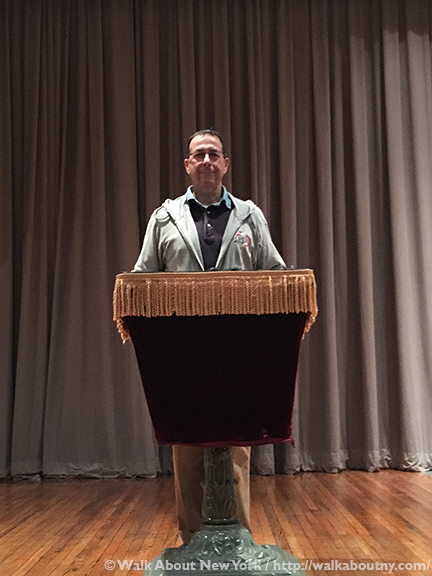 The lectern used by Abraham Lincoln and others, including your guide Phil at Cooper Union’s Great Hall. 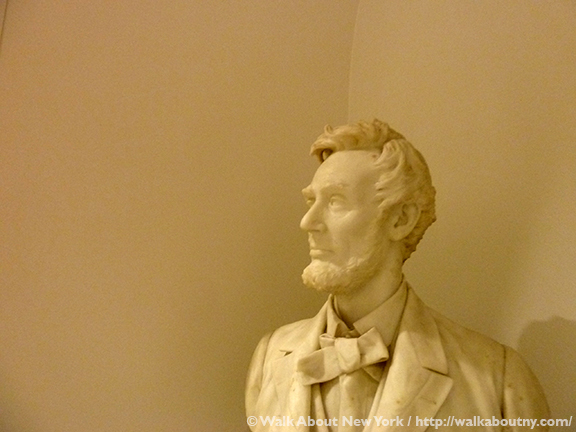 When you are part of our Five Squares and a Circle Tour you will discover Lincoln standing in Union Square. Take the Tour; Know More!